My detention and prison ministry began in Tuba City, Arizona on the Reservation around 1998, but my participation in detention and prison ministry in the city of Gallup formally began September 2011. I visit at the Gallup-McKinley County Adult Detention Center with other volunteers where each Sunday there is a Catholic Prayer service, attended by Catholics, Non-Catholics, Native Americans, Hispanic and Anglos. The average attendance is ten. Six volunteers form two teams of three, and we give a one hour prayer and scripture reflection service. Through donations, we are able to distribute holy cards and devotional pamphlets, and we use a guide sheet and church booklets for our services, so it is very easy for the inmates to follow along with the volunteers. 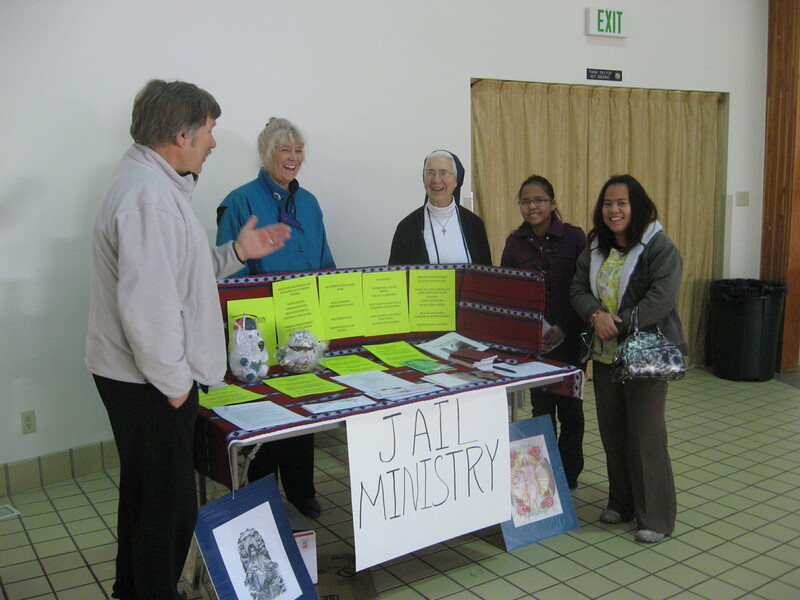 Sr. Racko, center, with volunteers at a recent ministry fair. Because I am a Spiritual Director, I am also able to visit one-on-one with inmates from the jail who so desire a spiritual conversation. I go once a week to meet with these inmates. It is a time of special sharing. A jail is where a person is incarcerated while they are awaiting their sentencing for a crime. For a minor offense a person could be incarcerated for two or less years in a jail, or detention center, but for a more serious offense and longer incarceration, the person is housed in a prison. There are three prisons nearby – two in Grants and one in Milan. For one year I have been going every week with a volunteer from Gallup to the New Mexico Women’s Correctional Center in Grants. We offer a Catholic Communion Service in Absence of a Priest. Recently two other volunteers from Grants have joined us this service. Father Alberto Avella and Deacon Larry Chavez from Saint Teresa’s Church in Grants visit every week at the men’s prison there. Every first and third Sunday of the month at the Cibola County Correctional Center – a prison in Milan for men awaiting deportation – Brother Chris Kirstien, OFM and I conduct a Bible study in Spanish. The average attendance is seven. The men at this prison have Catholic mass twice a month offered by Father Mike Vigil. Brother Kirstien, Steve Hays, and two other volunteers and I have also been coming from Albuquerque to be at the mass. The average attendance is 40. It is permitted that I serve alone if Brother cannot come there at Milan because the chaplain is always in the room for the services and bible study. Another volunteer, Catarino Hernandez, goes every Sunday to say the rosary with the men. From Our Lady of the Blessed Sacrament Church in Fort Defiance, Brother Michael Haag and two Mercy Corps Volunteers visit in the local jail. Also from that parish, Geraldine Wauneka and Francis Barney coordinate 25 parishioners who prepare and deliver a Thanksgiving meal for the jail inmates. The letter writing to inmates occupies the major part of my work days, Monday through Friday. It is called the Spiritual Correspondence Program, or commonly called the Penpal Project. The average number of letters coming in per month is 94; the average number of letters sent out is 76. There are currently 536 inmates in my records, but they do not write every month. Although I have three secretaries (Arlene Sandoval, Beverly Abeita, and Linda Hally) who volunteer three to six hours a week, we cannot keep up with all the letters. There is also one volunteer who only works at home, Judy Detorie, who looks up Internet answers for questions that inmates have. Another volunteer, Ethel Kayate, collects religious booklets for use in the ministry, and Roberta Tice, does little tasks at her home, such as taking the staples out of the small religious booklets. Emma Mace had been a faithful secretary for three months and has had to take a leave of absence for a while. I am always looking for more volunteers in the office and to other volunteers to become spiritual correspondents with the inmates. My presence in the Diocese of Gallup is completely supported by my community, the Daughters of Charity of St. Vincent de Paul. Through a grant from them, the letter-writing part of the ministry is supported. My office space in the Catholic Indian Center building is provided as a service in kind for my participation in the Breakfast Program there. The Bishop’s Appeal guaranteed the detention and prison ministry a grant of $2000 to help pay for the church booklets and transportation to and from Grants and Milan. Sr. Racko wishes to thank all the volunteers who help to make prison ministry possible: Susan St. Thomas, John Barton, Emilio Barriga, Andrew Rodriguez, Fran Pawlowski, Mary Wood, Ed Martinez, Fr. Alberto Avella, and Deacon Larry Chavez.